Take a look at my various art styles. If something strikes your fancy, please feel free to contact me about the piece. One thing I will readily admit is I have no idea how to properly photograph one of my pieces. Here I have a gallery of professionally photographed pieces that was done recently, which look great. I would like to give credit to my friend Nasco for doing an incredible job with these photos. Series of small pieces photographed at the studio for sale. My fountains come from small table top size, to full on park sized installations. Some are wall powered, for smaller indoor pieces. Larger, full on outdoor installation pieces are most often solar powered. 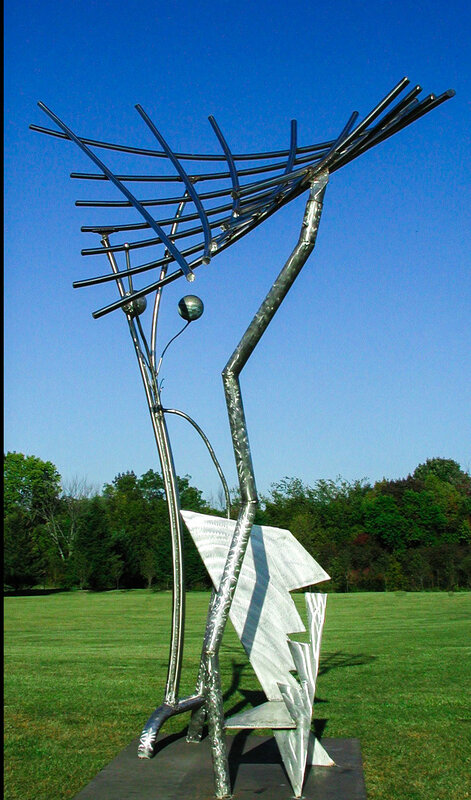 Steel is my medium of choice, and I have some of my most emblematic pieces listed in this gallery. Please feel free to take a look. In the 50+ years I have been making art, I have a large collection of past pieces, from paintings, to ceramics to odd doodads. I even have a 3D painting of a dog smoking a cigar made of clay, where the frame is also made entirely of paint.